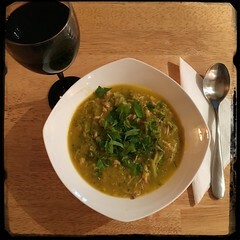 Here’s a great way to use the ‘left over’ vegetables from your homemade Chicken stock (try our version). While the leftover meat can be used to make sandwiches they also can be used in soups. A good thing about making a vegetable purée is that it’s creamy without the cream! It’s great for milk/cream sensitive people and tastes just as delicious. This recipe is based on out Cauliflower with Chicken Soup Purée. 9. add a last cup of water.